Multiple stakes winner On The Rocks may be given the opportunity to add Australian black type to his record. “We’ll see how he comes up and no decision has been made yet, but he could well end up in Melbourne or Sydney,” said Pam Gerard, whose training partner Michael Moroney also has a successful base at Flemington. Out of a half-sister to the triple Group One winner Efficient, On The Rocks was a $40,000 Karaka purchase by Moroney’s brother Paul. The colt showed he had inherited his share of the family ability with three wins this season, including the Gr.2 Avondale Guineas (2100m) and the Listed Trevor Eagle Memorial (1500m). On The Rocks also finished third in the Gr.2 Auckland Guineas (1600m) and was spelled after finishing eighth in the Gr.1 New Zealand Derby (2400m). “He is a talented horse and was unlucky a couple of times, he should have finished closer in the Derby,” Gerard said. While On The Rocks is unlikely to be ready in time for the Group One carnival at Hawke’s Bay in the new season, stablemate Ruby Armani is heading that way. The Makfi mare successfully bridged the gap to black type company during her last campaign with victory in the Listed Manawatu Anzac 1550m and finished third in the Listed Rangitikei Gold Cup (1550m) to close out her autumn preparation. “She’ll be going forward to Hastings, she looks fantastic,” Gerard said. 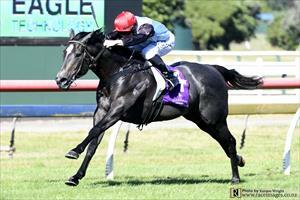 The Gr.1 Tarzino Trophy (1400m) and the Gr.1 Windsor Park Plate (1600m) are on Ruby Armani’s programme. – NZ Racing Desk.